I finally added the Vs. Maker Graphic Generator to ScrollBoss yesterday. What you can do is make a fake video game screenshot by making some choices on two different menus. 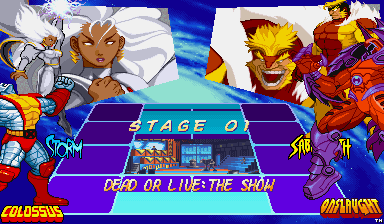 You can choose from different game screen set-ups and characters from Capcom, Marvel, and DC along with screen set-ups from games starring those characters. Yes, I said DC, although none of the DC characters have the bigger background pictures (known as ‘portraits’) so the custom Justice League Task Force VS. screen doesn’t use portraits at all. This thing is still a work in progress and only the screens in the “Marvel Super Heroes” style work 100% accurately. I’ve been mentioning it in posts since March 2007 and even linked to a cruddy beta test. It finally has an official spot on the ScrollBoss site after two years of scattered work and a huge scripting rewrite last week that allows more features like screens with four characters. There are still a few things I need to add before I can call the engine 1.00. More graphics, characters, styles and companies will be added even when the engine isn’t updated. Obvious missing characters like Batman, the rest of the original 12 Street Fighters and SNK as a whole are at the top of the to-add list. The ability to make message board sigs and avatars will be added later. If you dig it or don’t, please let me know what you think in the comments section here.